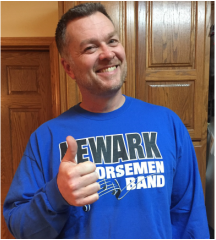 ​In my first year as Newark HS Principal, it has been great to see how Lisbon, Millbrook, Newark Grade and Newark HS all work together to make the Band Program such a huge success. With the vision and guidance of Ms. Chase, she is able to provide cohesiveness as the common denominator at each school. Membership to any organization is a clear sign of success or failure. Our Band program has about 80 students involved in it and that is nearly half of our student population. This wouldn’t happen without each schools support. It all begins in the elementary level, with a dream that Ms. Chase plants into these young students and then fosters that dream until they graduate from NCHS. I am very proud to be a small part of this team! – GO NORSEMEN! What is the meaning of Band? Webster says it is a group of people united for some purpose or a group of musicians playing together! At NCHS, LGS, and NGS that group of people is a very special group of individuals that work together to produce the best sound around! The band program at NCHS is alive and well. We continually have almost 1/3 of our students in the high school band. This is in big part to the teacher, Ms. Chase, and the “love” of music that she instills in her students—because she eats, sleeps, and lives band!! 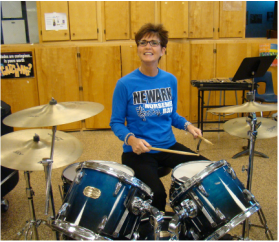 She shares that love of music with students here at NCHS, but also shares this love with Lisbon Grade School and Newark Grade School. This is a unique partnership between the 3 schools and a great community sharing of talent and services. So, when you come to NCHS—check out the band program. 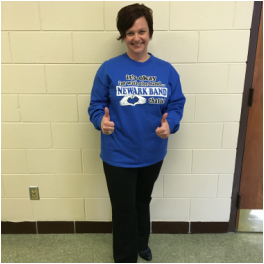 We are all musicians at heart—but Ms. Chase lets her love of band and music shine EVERY day! Band Together, the admin from Lisbon & Millbrook unite! As administrators of both Lisbon and Millbrook Jr. High, we are proud to promote the participation of our students in the band program. Ms. Chase had done an excellent job of teaching our students and her passion for the program is an inspiration to our school and community. Our students have excelled both socially and academically with the encouragement and support that Ms. Chase exhibits through her love of music. ​It is a privilege to have Ms. Chase as our band teacher. Our students benefit academically and socially while in the band program at MJH. Band is an awesome experience for all students! Our band is far reaching! They go on amazing trips – like the most recent Disney trip. Great company, great fun. Our band is multi-dimensional. They play Sousa, Conniff, as well as songs from Blues Crew and Frozen. There is a song for everyone. Our band is Number 1! Our band is awe-inspiring with what they able to play each year. Mrs. Chase is totally cool and shows students how to have fun while growing into young adults and musicians. Rows and rows of the finest virtuosos – the cream of Newark! Our Band is #1!